I loved this series! And, faithful readers, I FINISHED this series! This is huge, because it hardly ever happens. Meyer has created a Cinderella retelling that features fierce, independent, intelligent women who are willing to fight for what they believe in despite the forces that stand in their way. And they're surrounded by fierce, independent, intelligent men who let them. Which is also awesome. Cress and Winter are the third and final installments in this epic tale. 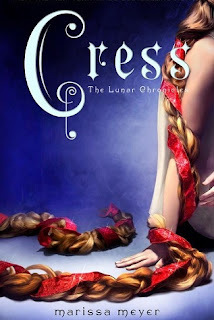 Cress introduces us to our Rapunzel character, a young Lunar woman held captive in a satellite and being used a spy. 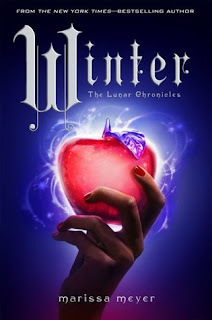 And in Winter we get to know the princess of Lunar (Snow White) and the stepdaughter of the evil queen Levana. There's intrigue, revolution, and a couple of intense battles that bring the story to a satisfying conclusion. It wrapped up a little too nicely for my liking, but I'm never really going to complain about a happy ending. I just usually want someone to die. Which is weird, I know. Quick recap: Cinder is a cyborg living in New Beijing. She's our Cinderella, living as a servant in her adopted mother's home. A plague is sweeping across the world, and Prince Kai, heir to the empire, is looking for a cure. Levana, queen of Lunar, has said cure, but it comes at a cost. She wants to marry the Prince and become, one day, the Empress of New Beijing. But Cinder isn't who she thinks she is, and there are forces across the world who are willing to go to fight against the unholy union. If you're a fan of audiobooks, Rebecca Soler does a fantastic job. I read Cinder, but then listened to the rest and enjoyed every minute. It's a fresh, creative retelling of a well known fairytale favorite, and I highly recommend it. Emily,I am so much happy to find Cress and Winter.I need physical science homework help. That was really nice thing to update informal essay topics from this website. Then every user happy to know the facts of this blog.